Since 2015, I have explored popular and unpopular sites, online magazines, print materials, digital projects, and everything in between. Having to do with contemporary art or not, I considered the design choices, the layout, the content management systems, the audiences, the reception, the statistics, the successes, and the failures of these print and digital materials. The bi-annual, online journal Sedimenta issues from this research. Before building Sedimenta, I was the project manager for Terry Smith’s spring 2016 course final project, “Coeval Connectivity in Contemporary Conditions” and the Visual Media Workshop’s Itinera, directed by Alison Langmead, both at the University of Pittsburgh. For the VMW, I continued a best practices workflow and built the website in which it’s housed. For the 2018 History of Art and Architecture graduate student symposium website, I built a pitt.edu WordPress (WP), hosted by the University of Pittsburgh. To do this, I applied for space on the University of Pittsburgh servers, installed WordPress on those servers after they conducted their cybersecurity protocols, and uploaded the site’s files onto the Pitt servers through File Transfer Protocol (FTP). After WP was installed, I implemented the style guide designed by developer, managed and wrote content, embedded Google Maps, and continue to update it. In the summer of 2018, I was a visiting scholar, fellow, and scholarship recipient for the University of Southern California and the Los Angeles Review of Books Publishing Workshop. During this five-week program, I hand-built, managed, and edited the publication PubLab and co-ordinated with the main editorial team of fellows. Here, I led a presentation, a workshop, and a training session on WordPress. The most important effect these presentations had was not that the editorial team magically knew everything about building a page; rather that the editorial team knew the complexity of site-construction and the frenetic mentality it necessitates to navigate dozens of open browser tabs, a few dozen people, within the framework of two other institutions. It was at the LARB | USC Publishing Workshop that I introduced to the professional publishing world my idea for a ten-year publishing and curatorial project. I insisted that after ten years, the project ends. When the LARB’s founder asked why I would “kill my baby,” I replied that having a beginning and end protects the project from scope creep, fizzling ideas, and abandoned accounts. Being able to plan for the end should be a critical consideration in all projects, and project sustainability is an ongoing consideration championed by Alison Langmead. I am indeed working with a theme, but to build a website, especially one like Sedimenta, requires that I construct, in-line element by block-element, upon an existing theme. A theme like the developer Qode’s $59 Bridge brings with it certain design and structural elements, such as: font, color, padding (spacing between elements), or blocks with certain functions. But my publication no longer even remotely resembles the original theme. Using the $45 editor WPBakery Page Builder and the $25 image slider builder Slider Revolution, I was able to build a completely unique site that most closely resembled my vision. Sedimenta, like most online and digital publications, started on paper. Pencil, gridded paper, and sticky notes comprise all stages of the publication’s construction in the form of wireframes, dozens and dozens of to-do lists, and design and conceptual style guides. Mentally keeping track of what needs to get done is impossible without these rudimentary tools. This explains Sedimenta’s online existence. There would be nothing to present if not for the hundreds of hours researching, writing, editing, and translating the therein housed essays, interviews, and exhibition and book reviews. All which finally enjoy the light of your screen. All which you can finally read here. Moving forward, I will draw up contributor contracts and establish funding and payment strategies, implement a blog component that will be regularly updated, and organize a set of best practices in the form of a style guide. First, I will work with a copyright paralegal to draw up contributor contracts. These contracts will include copyright and use of images and essays, as well as payment (per W.A.G.E. specifications) or honoraria. As I see it now, there are three ways of establishing a payment/honorarium strategy: through grants, 501(c) status, or for-profit. Second, to implement the blog, I will draw up a publication schedule that highlights books, exhibitions, and voices not featured in the biannual publication. These 100- to 1000-word pieces will be just a scholarly rigorous, but might express ideas and opinions outside the designated theme for the publication. Third, I will draw up a best practice style guide that will ensure consistency in design, grammar and style conventions, and outline protocols for grant applications, image-use copyrights, and author and artist payment or honoraria. I would like to thank my advisors Josh Ellenbogen, Terry Smith, and Kirk Savage in the University of Pittsburgh’s History of Art and Architecture department for allowing me the space within which I could explore alternative publishing avenues. At the Center for Creative Photography, I thank assistant curator Andrew Kensett for exchanging thoughts with me about Longer Ways to Go and the Museum of Walking’s Angela Ellsworth and her partner Tania Katan for sharing their home, books, and stories for an afternoon. At the Nevada Museum of Art, I thank Sara Frantz for guarding the gate and granting me access to the Center for Art + Environment’s Altered Landscape collection and to William L. Fox for his research, his encouragement, his book donations, and lunch. With an academic year fellowship from the Dietrich College of Arts and Sciences, I was able to complete not only Sedimenta‘s content, but also the nebulous microcosmos of WordPress wherein the content lies. Starting a journal by yourself is never quite by yourself. For the information infrastructure know-how, or rather, fumbling around, I thank LARB | USC workshop faculty Katelyn Keating, friend and mentor. For the freedom of space to explore my ambitious publishing ideas, I thank LARB founder and EIC Tom Lutz and workshop director Janice Littlejohn. A deep thank you, like I can’t tell you, to the print, digital, and worldly mentorship of Roy Christopher. Even more gratitude to Sarah Reiff Conell, Rae DiCicco, Emi Finklestein, and Golnar Yarmohammad Touski, who I hope are future collaborators. All of these have heard my incessant screams into WordPress’ blinky void. Lastly, I would never have imagined Sedimenta in the first place without two solo research road trips from Houston to Los Angeles–the second from Los Vegas to Reno, Nevada through the Sierra Nevada Mountains–which were funded by Dietrich Summer Travel Grants. That second trip started this summer in mid-June and finally–mercifully–ended in mid-August. You can manipulate the embedded map above, but I believe in the map below, you can see a fragment of those eight weeks in the form of a 2,500-mile line and the emulated curvature of Google Earth. It was profoundly solitary experience I am not interested in repeating but recommend to all. 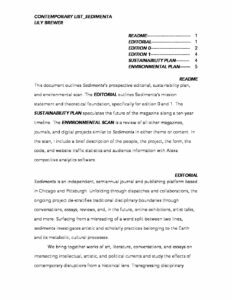 The document to the right outlines Sedimenta’s prospective editorial, sustainability plan, and environmental scan. The EDITORIAL outlines Sedimenta’s mission statement and theoretical foundation, specifically for edition 0 and 1. The SUSTAINABILITY PLAN speculates the future of the magazine along a ten-year timeline. The ENVIRONMENTAL SCAN is a review of all other magazines, journals, and digital projects similar to Sedimenta in either theme or content. In the scan, I include a brief description of the people, the project, the form, the code, and website traffic statistics and audience information with Alexa competitive analytics software. Click on the image to the right to read the documentation.